This is a summary of Oxford Civic Society’s response. You can download the complete document here. On 9 January the City and County Council published the results of a study by consultants Phil Jones Associates and Integrated Transport Planning to develop a transport and public realm strategy for Oxford City Centre. The study is intended to feed into the City’s Local Plan (currently in preparation) and the County’s Oxford Transport Strategy. Two options were presented. 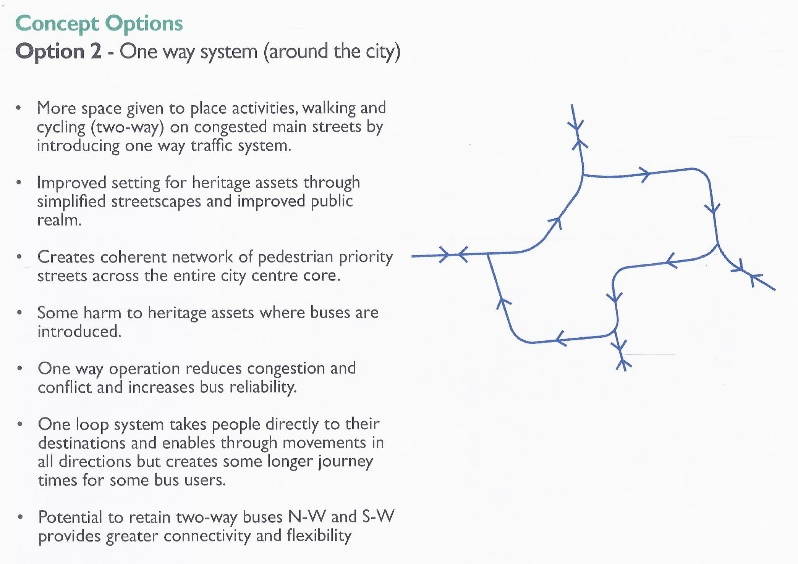 Both involve one-way bus loops, in some cases using roads which are currently bus-free. Cycling would remain two-way on all roads. 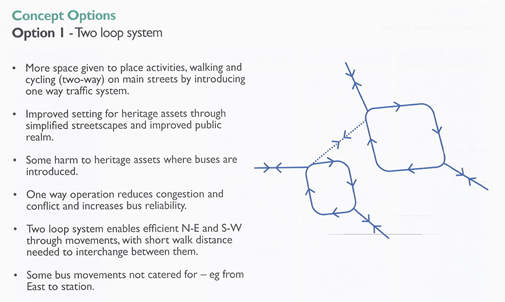 The so-called ‘2-loop’ option sees buses terminating either in a western loop centred on Castle Street and Oxpens or in an eastern loop centred on High Street and Broad Street or South Parks Road. This option would remove vehicles from St Aldates, which could then become a pedestrian priority street. The downside is that it would bring buses back to Cornmarket, recreating conditions which the Councils have been trying eliminate. But its over-riding shortcoming is that it cuts all east-west bus movements across the city centre, cutting off the station, Botley and the developing areas of Oxpens and Osney Mead from East Oxford, the hospitals and other major employment centres in Headington. 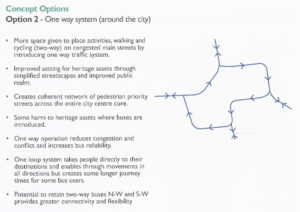 This conflicts with the consultants’ own aims of ‘maintaining good bus access to key locations in the city centre’ and ‘minimising the need to interchange’. The scale of potential inconvenience to passengers seems to make this option a non-starter. The alternative offered is a single-loop This would be a one-way loop around the whole of the city centre via Castle Street, St Aldates and High Street in the south, Worcester Street and Beaumont Street in the west, Longwall Street in the east and either Broad Street and Holywell Street or St Giles and South Parks Road in the north. It seems highly unlikely that bringing buses into Holywell Street will be acceptable, and the longer alternative using South Parks Road moves services even further away from the demand centre. There would also be problems with increased bus movements in the Beaumont Street/Magdalen Street area. For these and other more detailed reasons this option seems to be a non-starter too. We note that the work done so far only considers local bus services. The effects on other services from outside Oxford, including the London and airport buses, have not been considered. Nor is there any attempt to allow for and quantify modal shift, congestion charging, workplace parking levy, or any other possible mitigation measures. The same goes for technological developments, alternatives such as trams or light rail, and changing travel patterns as the city develops over the next decade or two. A much more thorough consultation is needed, with a remit wider than just a snapshot of bus travel within the city,and with as much relevant background data as possible. The follow-up to the 9 January event needs to be in a form which allows time for a proper discussion and debate.